Golden Girls homes create a community for women (and men too!) around the age of 50's to 60's to live together under the same roof. Typically each person has her own private bedroom (and possibly bathroom) while sharing a common kitchen, living and dining area. The benefits of creating a shared living situation are many, including companionship, friendship and support of women at a similar point in life. Golden Girl Homes are for active seniors that do not want to live alone anymore. They want to age in a community setting. Plus, sharing the housing expenses makes it possible for housemates to live in a more expensive home and neighborhood than they could have afforded on their own. This house-based intentional community has many benefits, including personal privacy, companionship, and reduced daily expenses. On the financial side, you share the rent or mortgage payment, house maintenance and upkeep of common spaces, such as the kitchen, living and dining areas. To successfully live with housemates, you need to enjoy spending time with others. Sharing a home, especially as an adult, requires lots of interaction – both spontaneous and planned – with your housemates. It’s not that you need to be an extravert but, if you are an introvert, you are comfortable having daily contact with housemates. Will you feel comfortable being seen when you come out of the shower wrapped in your towel or robe? Can you tolerate someone saying hello before you’ve had your first cup of coffee? Depending on the design of the home and the location of bedrooms and bathrooms, you may be interacting with your housemates first thing in the morning or throughout the day. Ask yourself, “How much privacy do I need?” Will you feel “surrounded” by housemates or will you enjoy the company of sharing a kitchen and dining area with others? If you like having people around when you cook, then this lifestyle may work for you. 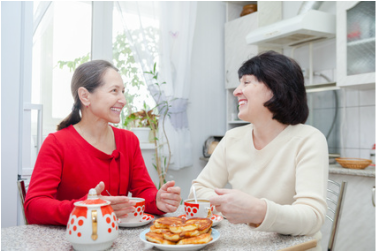 When considering sharing a home with other Boomer adults, it’s important to be flexible. People and circumstances change, sometimes with little advance notice. If you’re someone who can flow with the small and large changes in people’s lives – from lost keys to lost jobs – the better your chances of successfully living with others. Living in a shared home, almost by definition, requires a higher level of sharing. It’s inevitable that items like kitchen tools, books and other personal items will end up being used (and sometimes broken) by housemates. Your level of comfort around sharing your things will contribute significantly to your success in this housing arrangement. Saying what’s important to you and establishing boundaries can go a long way to making a shared home work after you move in. Many issues come up when you’re living in a “Golden Girls-like Home.” You’ll be dealing with use of community spaces, finances, guests, activities, pets, standards of cleanliness and more. To successfully navigate through all these conversations and make sound group decisions requires clearly expressing your personal preferences and hearing the needs of your housemates.